The changeable weather this August has ranged from sweltering hot to cool and rainy, filling the skies with billowing clouds. 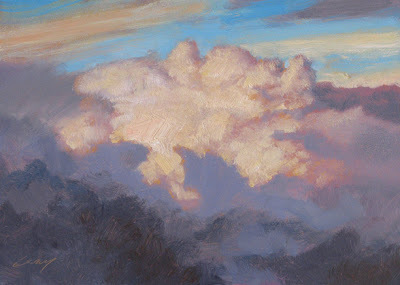 breath-taking, you have captured the view from mountain peaks Don... and talking of clouds, it's the great minds syndrome again:)r.
Don you painted that as if you were amongst all the fluffiness! LOVELY! Rahina, how funny! Your comment here made me expect I'd see a cloud painting on your site...I didn't get it until I read the post. We've got clouds on the brain! Thanks for your comment. Thanks, Erika. People have often said I've got my head in the clouds, so I thought why not prove it! A really nice cloud painting. Struggling with one myself I can appreciate it all the more. Hi Bill--thanks a lot. They are more of a challenge than they ought to be, aren't they?